Now, onto this tag. I think the exercise was to create something that looked like weathered wood, but when I got through dragging the aqua and lettuce sponge dabbers on my tag and they dried, then I started sponging distress inks it kind of whispered GARDEN to me. Maybe I had the Theme Thursday challenge rattling around in the old noodle. So, with Artful Things and Flights of Fancy stamp sets I went crazy stamping, then to finish it off I added some of my favorite fuzzy fibers. I hope it turned out in the spirit of the technique. Tim Holtz is such a phenomenal innovator and teacher. I'm so glad I found Studio L3 because I have been really enjoying putting these techniques and supplies to use. 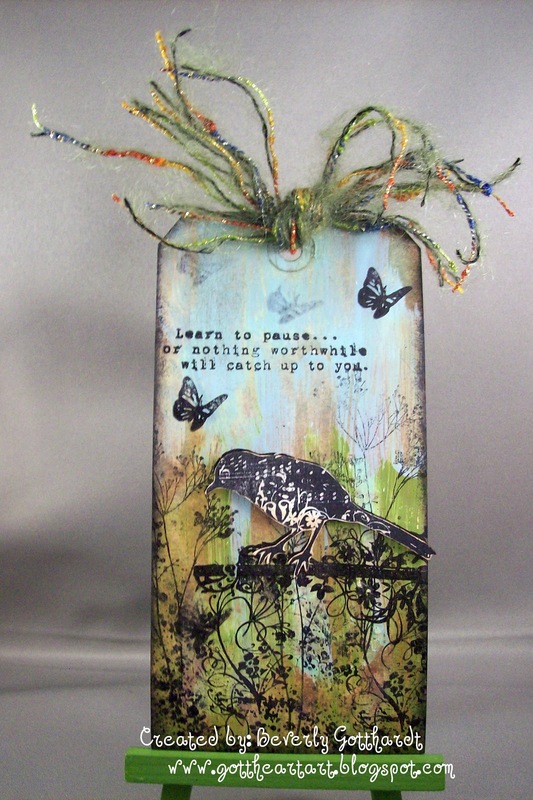 Supplies: Manilla Tag, Paper: SU-Naturals Ivory card stock, Stamps: Stampers Anonymous-Flights of Fancy, Artful Things, Ink: Distress Inks-Weathered Wood, Tattered Rose, Frayed Burlap, Tea Dye, Victorian Velvet, Adirondack Paint Dabbers-Aqua, Lettuce, $ Store Fibers, SU dimensionals. Love the idea and huge amount of detail in this - it's really gorgeous! beautiful detail and colours - just so pretty and pure. That is a beauty ! What a beautiful tag! Love all that awesome fiber on top and how it matches your coloring. Beautiful tag! Love how you put it together! What a scene you've created, ha, but it's a very pretty one. Don't you love how things become something you hadn't imagined! It is a lovely garden. WOW! This is absolutely gorgeous! Beverly, I love how you used the GM06 technique here, and you're so right-- it's perfect for a garden-themed piece. I love the stamps you used, and the layout is brilliant!